In Ukraine, at least one National Guardsman has been killed and at least 50 more people injured in clashes outside Ukraine’s parliament. Ukrainian nationalist protesters attacked security forces as lawmakers voted to decentralize power in the pro-Russian, rebel-held east. Ukraine’s interior minister, Arseny Avakov, says the guardsman died of a shrapnel wound to the heart. The shrapnel was thought to have come from a grenade thrown from the crowd of nationalist protesters. Authorities said the suspect was apprehended along with about 30 others. 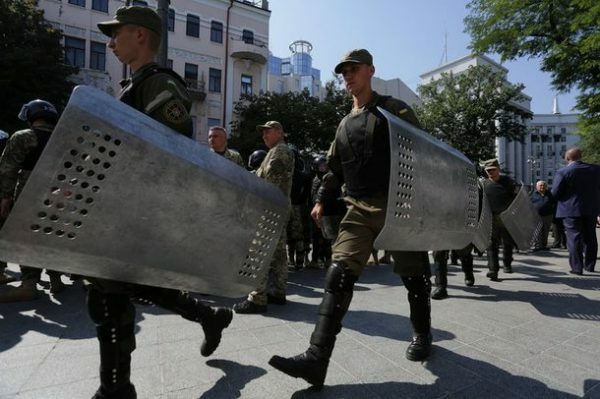 Avakov accused a member of the right-wing Ukrainian Svoboda party of launching the grenade as they clashed with guardsmen in riot gear outside parliament. Some of the 100 or so protesters were armed with batons and wore masks as the two sides exchanged tear gas and pepper spray. The explosion occurred as a line of guardsmen tried to hold back nationalists opposed to a vote in parliament to grant more power to the rebel-held east. Ukrainian lawmakers Monday gave initial approval to decentralize the constitution in line with a Western-backed peace agreement. Parliament speaker Volodymr Groysman said the change would allow Ukraine to escape from being a centralized, corrupt country. He says the constitution, which they are now considering on the first reading, is a basis on which a real European, united and sovereign country will be built. He says he will never in his life allow himself to vote for some special status of anyone. Critics say granting more power would mean Ukraine’s losing sovereignty and independence at a time when it is facing Russian-backed aggression. In the first reading Monday, 265 lawmakers voted for the change but 300 votes are needed for it to pass a final reading to become law. Ukrainian President Petro Poroshenko has been pushing for the change, but faces opposition from nationalists and even a few parties in his coalition. Even if they can muster the votes, the rebels, who have complained about not being consulted, are not likely to accept it, says Dmitri Trenin, director of the Carnegie Moscow Center. The bill led to heated exchanges inside parliament as well. Many deputies shouted “shame” as the bill was being debated and some tried to block speakers.